Steve Schimoler of Crop Bistro recently opened a restaurant on the East Side in the new Uptown District (intersection of Euclid Avenue and E. 115th across from Constantino’s and behind the Cleveland Wine Cellars). Steve relocated to Cleveland in 2005, as Director of Innovation and Development for Nestle North America and, after completing his term there, decided to remain in Cleveland, and we are all the better for it. 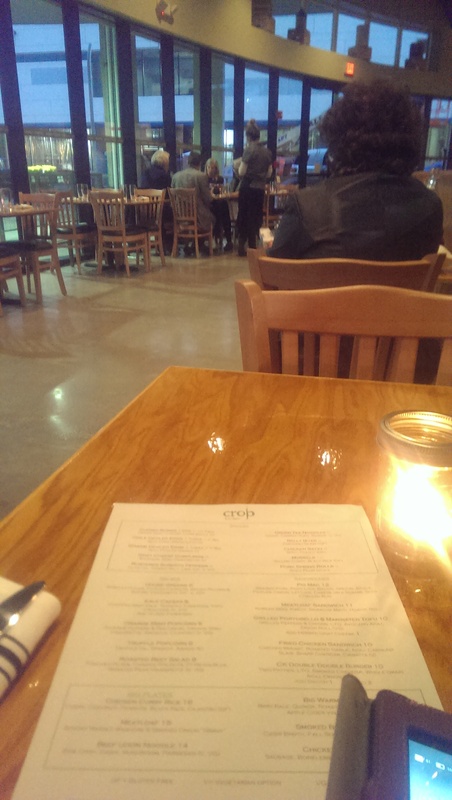 Crop was initially opened to function as a test kitchen, but soon became a Cleveland favorite. His son Stevie is the General Manager of Crop Kitchen, and they recruited Matt Anderson of Umami to run the kitchen. I’ve been there several times now and am happy to report the quality of Crop is available on the East Side in a hip, affordable location. Crop Kitchen is located where the old Accent used to be. 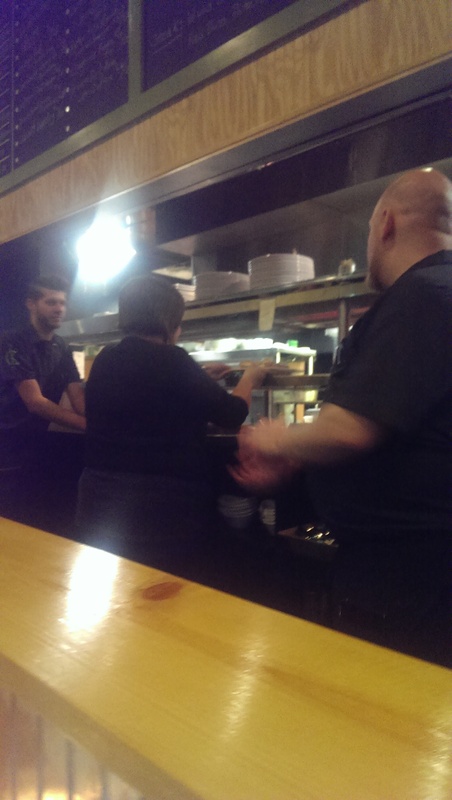 They managed to inherit Accent’s awesome Robata Grill and Josper Oven. They changed the colors a bit and put up whimsical colanders as light fixtures. One side of the restaurant has a pool table and makes it the perfect venue for after work drinks or a quick, informal bite to eat, while the dining room offers light wood tables and plenty of tables to accommodate any sized party. Crop Kitchen features Crop favorites like two different flavors of popcorn (orange miso and truffle) as well as Matt Anderson specialties like spring rolls, sushi and the goat cheese dumplings (more on those later). I started off with the Sleepy Hollow cocktail, which featured house-infused pumpkin vodka with a house-made apple crème liqueur. It was delicious. Unfortunately they are only running it in the fall, because on a visit in early December I was told they had just taken it off the menu. The chile deviled eggs with crisp prosciutto are a mustardy choice for an appetizer. It was very good, with just a hint of heat and prosciutto flavor. 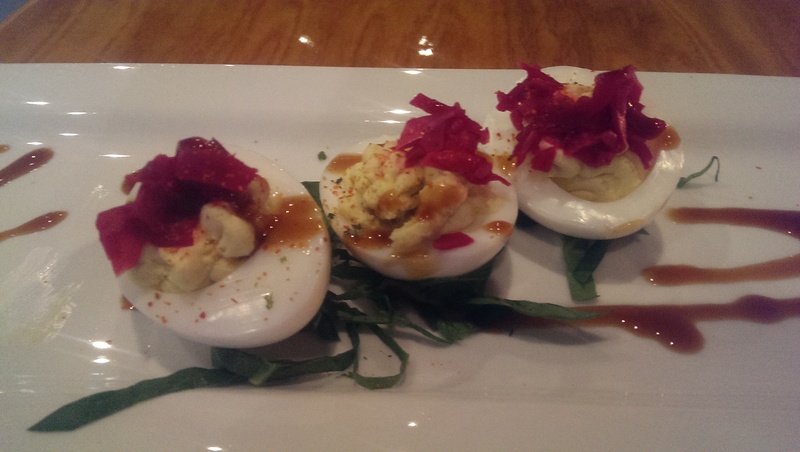 However, you have to try the wasabi deviled eggs with pickled ginger. They are out of this world! A friend and I were served one each served side by side recently, and the wasabi egg was my hands-down favorite! When I heard Steve was doing a burger for the first time ever I knew what I had to order on my first trip. The CK Double Double Burger was even better than I had hoped it would be. 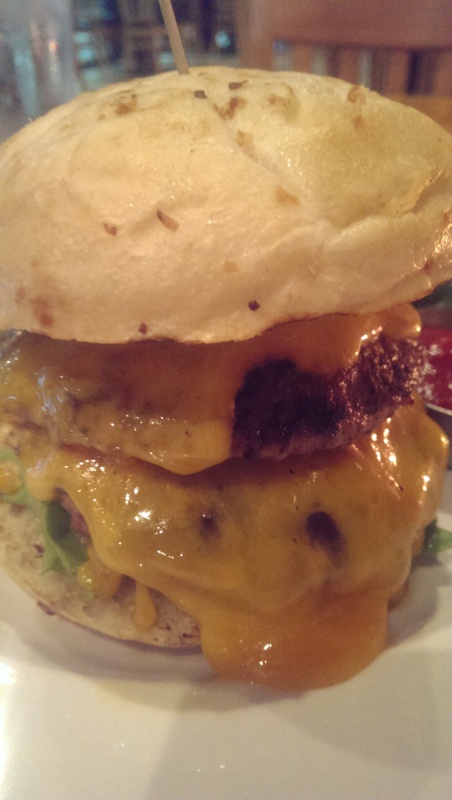 It features two all-beef patties, lettuce, tomato, onion, smoked cheddar cheese, and Dijon aioli on an onion bun. The onion bun and the melty cheddar cheese really put this burger over the top. It was cooked exactly to my specifications and was AWESOME. 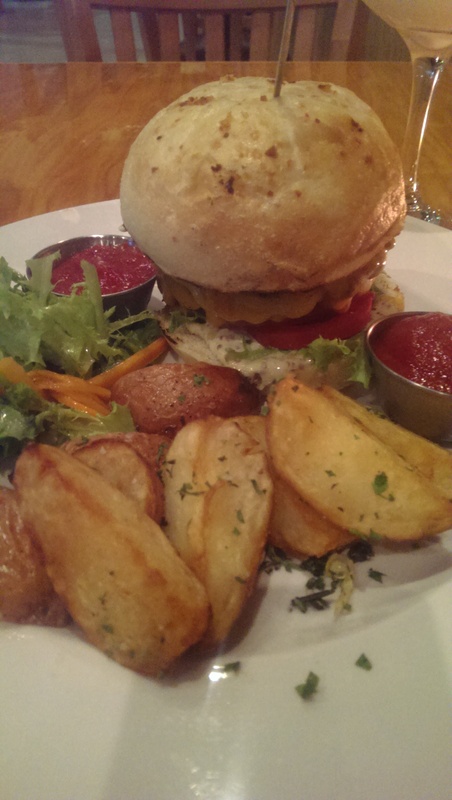 The roasted potatoes that accompanied the burger were perfectly cooked, with a crisp exterior and creamy interior. I was able to dip them in house-made ketchup. I was less impressed with the sushi rolls. The tempura veggie roll was kind of bland, and the spicy tuna roll didn’t wow me. They serve three rolls a night, and the selections vary. I will try them again, but as of right now I am not all that keen on ordering them again. That said, the fish was very fresh, and the sashimi someone ordered at the next table glistened and looked delicious. However, you definitely should not avoid the Asian side of the menu. I can report that I had the duck ramen special the other night, and it was spectacular. 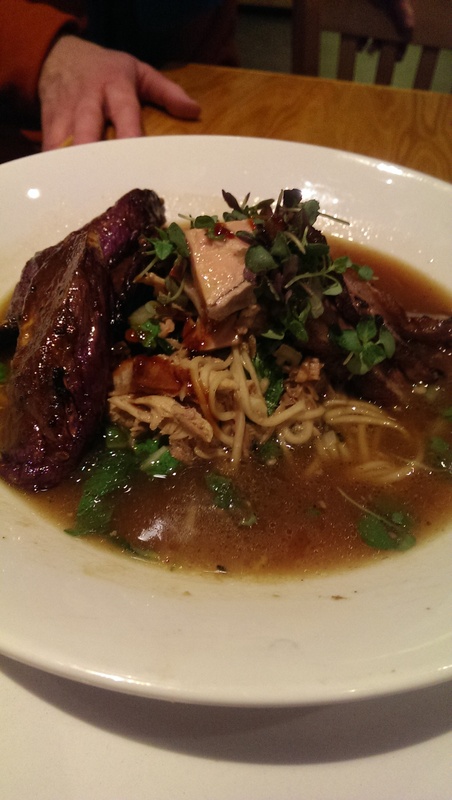 It featured pork belly, duck confit and grilled eggplant and had a delicious gingery and umami taste in the broth. I hope to see this on the menu again soon! Matt Anderson is also known for his goat cheese dumplings. These dumplings are crazy good. 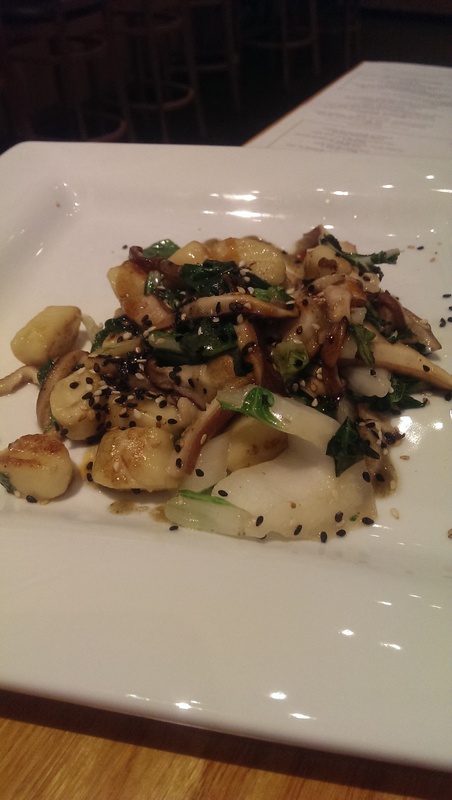 The dumplings are light and fluffy and are served over a bed of shiitake mushroom, miso vinaigrette and what may be sauteed spinach or kale. This dish is a good choice for vegetarians as well as non-vegetarians. The menu indicates if a dish is gluten-free, vegetarian or vegan, which I think is a nice aid for those with dietary issues. I had debated between the burger and the cassoulet, so I decided to wait and order the cassoulet once the weather turned a little colder. This is the perfect comfort food for a cold, dreary Cleveland winter. 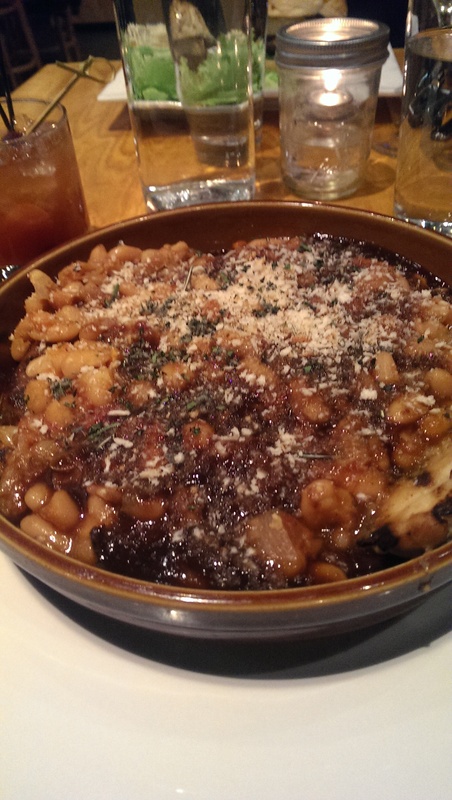 The cassoulet is made with sausage, boneless chicken thighs, pork belly, and beans. I loved the melding of all the flavors. The beans were creamy and smokey. I liked this more than the cassoulet at L’Albatros, and the cassoulet there is really good. I managed to eat half and save the other half for later. It was just as good – if not better – reheated the next day. 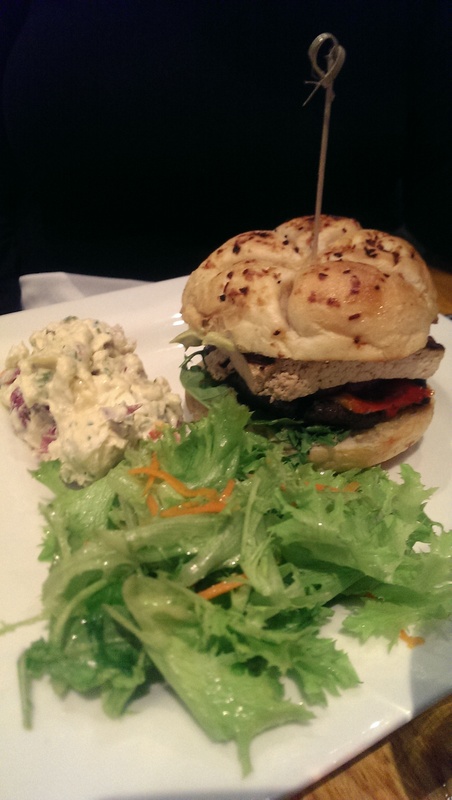 I had a couple bites of the potato salad that came with my friend’s Grilled Portabello & Marinated Tofu sandwich, which features grilled peppers & onions, lettuce, tomato, onion, avocado aioli and herbed goat cheese on request on the onion roll. She loved it and said it was some of the best tofu she has ever eaten. I have to say I am now a huge fan of the potato salad, and I am a tough critic when it comes to potato salad. It was creamy and had just the right mix of herbs. Definitely try it if you can. They only serve one side a day, so don’t come in there looking forward to a specific side dish. The orzo side dish I had the other day needed some citrus or something to brighten the flavor a bit. Crop Kitchen should consider posting its sides and specials on its Facebook page, because I would make a trip for the potato salad and would be there in a heartbeat for any of their ramen. In addition to drawing in customers, it would also highlight the kitchen’s versatility. I also want to talk about the ice cream and sorbet at Crop Kitchen. 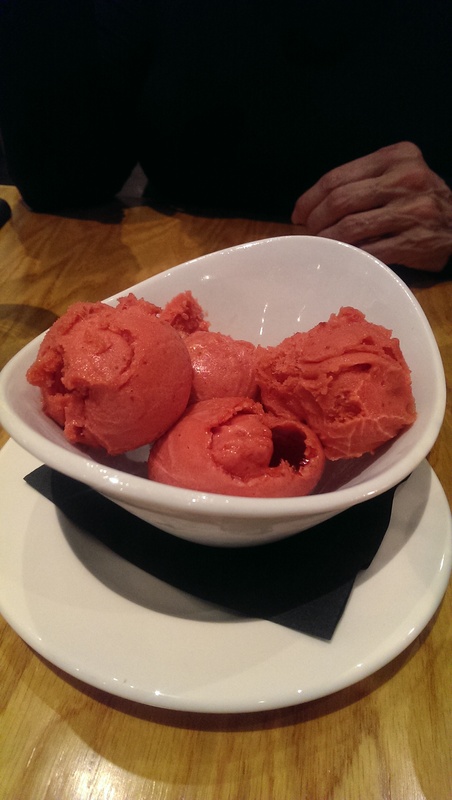 My friend and I split the Ohio Strawberry Sorbet recently, and it was bright and fresh. It was the perfect end to a meal of goat cheese dumplings and cassoulet. Steve was the VP of product development for Cabot Creamery in Vermont for several years, so the man knows his ice cream. I was lucky enough to hear about the recent launch of Pierre Ice Cream’s Chef’s Signature Ultimate Ice Cream Pints. You can read about the story here. They unveiled the first two flavors — Croppy Road and Holé Molé — on December 5th at Crop Kitchen. Croppy Road features chocolate ice cream, chocolate-covered marshmallow cups, almonds and smoky salted caramel swirl, while Holé Molé incorporates cinnamon ice cream with chili choco chips, chocolate-covered toffee pieces and molé fudge swirl. The Croppy Road was very smoky, but if you like that you will love the unique ice cream. 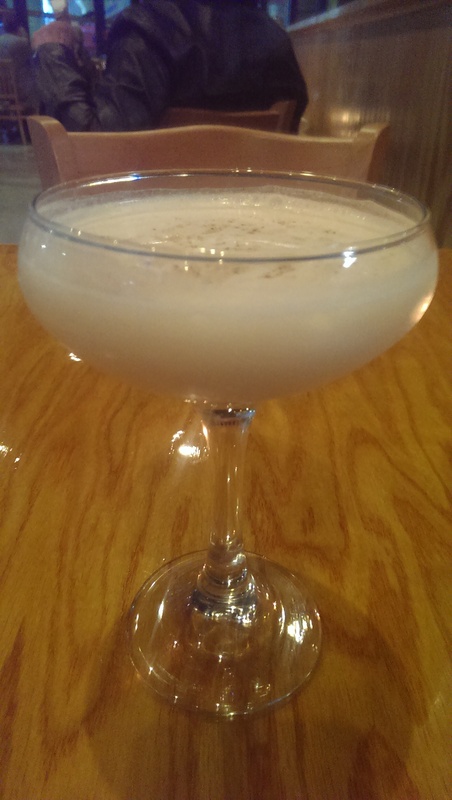 However, I am head over heels for the Holé Molé. 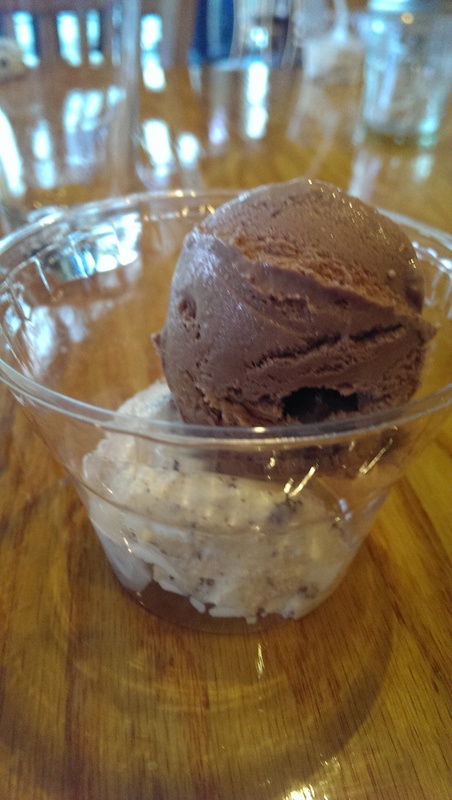 You can order the ice cream by the pint or in a sundae at Crop Kitchen (and I would imagine Crop), and the pints are also available in local grocery stores that sell Pierre’s products, including Heinen’s, Marc’s, Dave’s Supermarkets and Zagara’s Market. 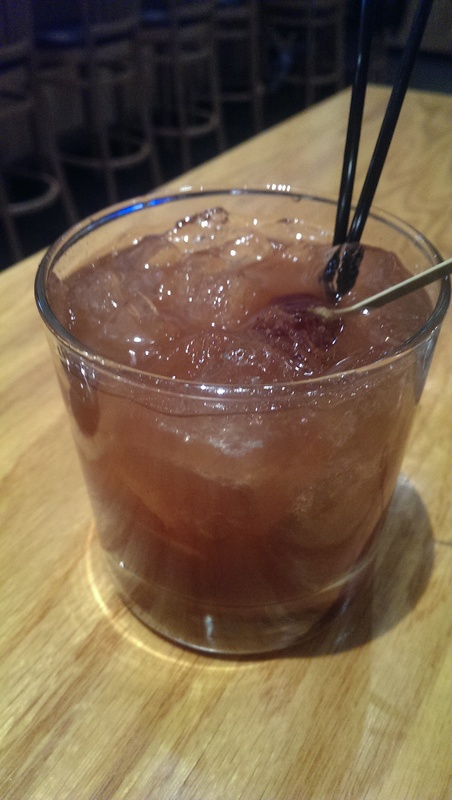 One final recommendation is the Maker’s Mark New Fashioned, featuring Maker’s Mark with hints of spiced orange and cherries in their housemade Orange & Cherry Chipotle Cure. I had two the other night at a good friend’s recommendation (her husband loves them so much she ordered 2 quarts of Cure for him for Christmas). They are delicious, but they are potent. Another friend I was dining with was surprised to see me happily buzzed, because I never have more than two (and we’ve been going out together to happy hours since 2005). The drinks here are strong, so plan accordingly. Welcome to the neighborhood, Crop Kitchen! I’ll be back soon.